Having received an endless stream of hype for their self-titled debut, this quartet will finally release their much anticipated sophomore set next week, and we couldn’t wait to share our impressions. If the debut was chiefly defined by Ezra Koenig’s lilting voice and soukous-style of guitar, the power of this second record very much resides in the hands (and dials) of Rostam Batmanglij’s arsenal of instruments and skilled studio work. 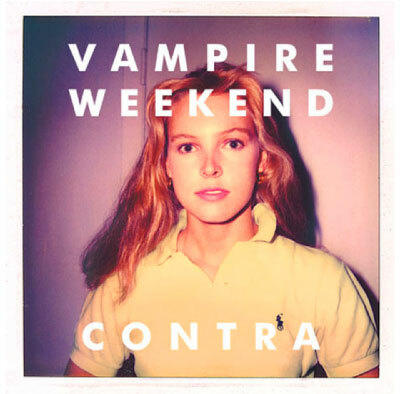 In fact, Contra’s ten tracks ostensibly diverge on two paths: One (anchored by songs such as “Cousins” and “Holiday”) continues the jubilant pop that turned the debut into a surprise hit; the other boasts a more baroque strain of synths and samples — first demonstrated in October’s release of “Horchata” as well as on the reggae-tinged “Diplomat’s Son”, which appropriates vocals from M.I.A.’s “Hussel”. These distinct paths collide and culminate in standouts “Run” and “Giving Up the Gun”, in which carefree harmonies crash into digitized blips and beats. As Koenig sings on “Giving Up the Gun”: “Your sword’s grown old and rusty/Underneath the rising sun”, it almost seems the band is consciously trying to overcome the sophomore slump of sameness that doomed so many upstarts before. For that matter, even “Cousins” subverts the formula of earlier hit “A-Punk” by adding an aggressiveness we didn’t realize the band possessed. Thus, on this second album Vampire Weekend achieves the rare feat of honoring what earned them initial acclaim, while still evolving their style with an ambition that promises even more excitement in releases to come. Watch “Cousins” after the jump. Buy this at Other Music or iTunes.